Alex Kidd: The Lost Stars (アレックスキッド ザ・ロストスターズ) is an arcade platform game developed by Sega for the Sega System 16, and later ported to the Sega Master System. The Master System version was made available on the Wii Virtual Console in 2009. 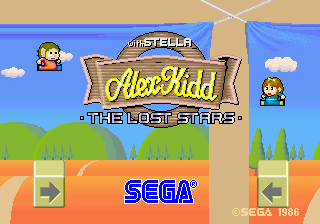 The player assumes the role of Alex, and in the arcade version, the second player controls Stella in co-op mode. The game consists of six levels, each with a miracle ball to collect at the end of it. Once complete, the levels are repeated in a second "loop". After saving planet Aries from Janken the Great, in Alex Kidd in Miracle World, Alex decides to explore the mysteries of Miracle World, until he discovers that the twelve stars of the Aries Constellation were stolen from the sky. He meets Daleda, an ancient wizard, at the top of Mount Eternal to learn that Ziggarat had stolen the same stars over five thousands years ago, and Halifax Kidd, Alex's ancestor, journeyed beyond the realm of space and time to defeat Ziggarat and return the stars to the sky. Now, Ziggarat is back and Alex must follow Halifax's footsteps to save the Aries Constellation once again. The System 16 version features a button for jumping and another for shooting. In the Master System version shoots and jumps, when the character is on the ground. If you are underwater, holding will make the character float, and then you can move to all eight directions; releasing makes you sink. Levels 1 and 8 are represented by the zodiac signs of Aries and Scorpio, respectively. Levels 2 and 9 are represented by the zodiac signs of Taurus and Sagittarius, respectively. Levels 3 and 10 are represented by the zodiac signs of Gemini and Capricorn, respectively. Levels 4 and 11 are represented by the zodiac signs of Cancer and Aquarius, respectively. Levels 5 and 12 are represented by the zodiac signs of Leo and Pisces, respectively. Levels 6 and 13 are represented by the zodiac signs of Virgo and Libra, respectively. Levels 7 and 14 are in the outer space, and are not represented by zodiac signs. In these levels there is reduced gravity, so your jumps are about twice as long as the usual. Main article: Alex Kidd: The Lost Stars/Magazine articles.